I have a problem. Well, actually I have many problems but right now I have one particular problem on my mind. Rats! Every night they dig the earth out of my flower pots making a mess and sometimes killing the plants. I had put strong wire netting over some of the pots to prevent their burrowing and then the resourceful little devils chew through the hard plastic/resin pots and get in again. But their presence is not just seen in the garden. While we are meditating in the hall we sometimes hear the pitter patter of little rats’ feet above the ceiling. Last month the hall started to smell and over a few days it got worse and worse. I removed one of the ceiling panels closest to where the smell seemed to be coming from only to have a shower of maggots fall all over me, an experience you would want to avoid if possible. These delightful creatures were feeding on a dead rat. Although it hasn’t happened yet (at least I hope not) rats’ feaces and urine mixed with dust in the ceiling can filter down and be breathed in causing several nasty diseases. Anyway, something has to be done. Over the last week I have set traps, the type that catch the fellows without harming them. I have caught six so far, but all young ones, which I have subsequently released down on the bank of the Kelang River nearby. But I can’t catch the adults. They are too wily to enter the trap and take the bait. Of course wherever you find people you will find rats. But my problem is made worse than usual because of the open-air restaurant downstairs which means that there is plenty of food scraps for rats to eat. My rat problem has made me think, and not for the first time, about the universal viability of the First Precept. Is it really possible to uphold the Precept in all circumstances? Could there be situations where it is actually wrong to practice the Precept? Here are a few actual, not hypothetical, scenarios. The Red Squirrel is threatened with extinction in the UK due to the introduction of the more aggressive and disease resistant Grey Squirrel. To save the former they are ‘culling’ (an environmentally friendly way of saying ‘killing’) the latter in certain areas in the hope that the former can recover. There are quite a few other examples of where this sort of thing is being done. As a Buddhist what do you do? Let a species become extinct or do the needful? You notice that the kids are constantly scratching their bums or itching their heads – the symptoms of head lice and bowel worms. As a caring and responsible parent you shampoo the kids with Louse-Buster or give them a dose of worm medicine. But as a sincere Buddhist what do you do? And now you have discovered that Fido is covered with fleas, so you’re going to have to do something about that too – quite apart from anything else he keeps bringing the fleas into the house. The army of a belligerent power has just taken over the country and you have heard they are rounding up certain ethnics groups and rumor is they are ‘resettling’ them in large pits they have dug in the forests. You are a Buddhist. What do you do? Join or covertly support the resistance, or just keep your head down and hope you survive until others drive the enemy out? You run a Buddhist society in Singapore and…well, you know the situation. Rats multiply at an astonishing rate. What do you do? The question does not seem to have worried traditional Buddhists too much. They have generally been quite kindly to animals although all have had armies and engaged in wars, some still do; e.g. the ethnic wars in north-east Burma, the insurgency in southern Thailand. I lived in Sri Lanka during much of the vicious civil war there and can never remember the contradiction between Buddhist ethics and the grim reality being discussed in any meaningful way. They seemed to take what I call the Nike approach – Just Do It. But these Burmese, Thai and Sri Lankan examples are the extreme outer edge of the issue. 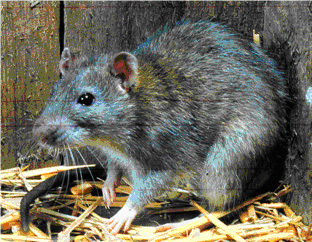 What does a sincere Buddhist who takes the Dhamma seriously do about a rat infestation? Reading the suttas is always interesting, in as much as they show how little we humans have changed in some ways over the centuries, how little of what we do is actually new. Recently I was reading the Chaddanta Jataka (Ja.V,45-7). This charming story is interesting in itself but of extra interest is its detailed description of a mountain-climbing expedition. Mountain climbing is little more than two centuries old while rock-climbing has only become a recognized sport/activity in the last few decades. Reading the Chaddanta Jataka shows that people were doing both, although not as a recreation, as far back as the 5th or 3rd century BCE. 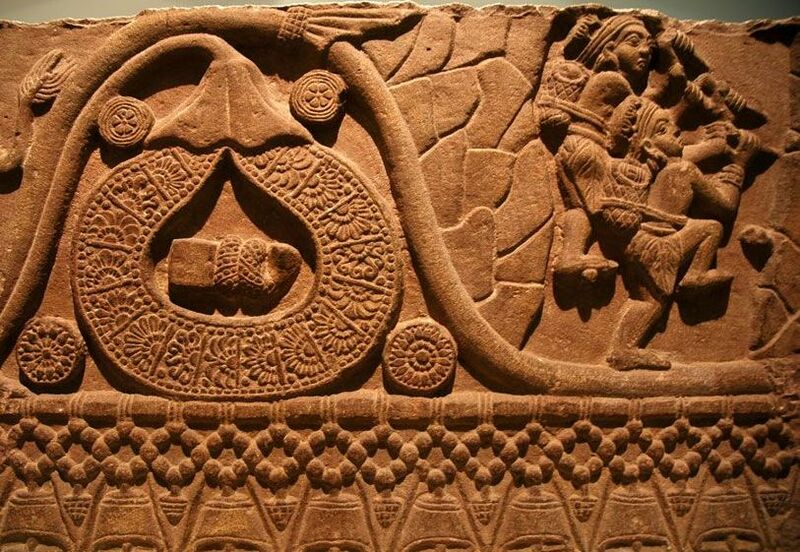 Very briefly, the Chaddanta Jataka tells of a man who undertakes to go to a remote mountain wilderness to kill a miraculous elephant and bring back its tusks for a queen. Knowing that he will have to ascend extremely difficult mountains he prepares himself well. A list of the equipment he takes includes a knife (vasi), hatchet (pharasu), spade (kuddala), a sharp instrument for cutting bamboo (nikhadanamutthika velu), grass-cutter (gumbaccheda), metal rod (lohadanda), iron grappling hooks (ayasinghataka), pegs or bolts (khanu), hammer (muggara), leather ropes (cammayotta), webbing (varatta), elephant boots (hatthiupahana) and most interestingly, a leather parachute or glider (cammachatta). He also took his own firewood and barley meal, perhaps a type of energy food. Everything was carried in a leather (waterproof ?) pack (cammabhasta). The first part of his journey is taken by chariot, then his porters help carry his gear until he gets the uninhabited forest after which he proceeded alone. The text describes how he cuts his way through a thick forest, improvises a raft out of a log and a ladder (nisseni) out of bamboo to cross difficult terrain until he reaches the foot of the mountain. Then tying the rope to the grappling hook he threw it onto the rock, secured it and began his assent. Using the diamond-tipped iron rod he drilled holes in the rock, hammered pegs into them and climbed up on them. On reaching the first peak he let himself down the other side with the rope, ‘like a spider letting out its web’ (makkata sutta vissajjana karena). Getting to a cliff or gorge he waited for ‘a gust of wind and then taking his parachute (or glider) he glided down like a bird’ (vatan gahapetva sakuno viya otaratiti). In this way he climbed over six mountain ranges until he got to where the elephant was. One can only assume that these details, so precise and realistic, are based on actual mountain climbing expeditions that really took place. Perhaps they reflect early attempts by Indians to penetrate into the Himalayas and eventually beyond them to the Tibetan Plateau. One final thing. 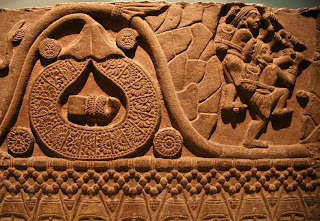 In the National Museum in New Delhi there is a fragment of the railing from the great Buddhist stupa at Bharhut dating from about the 2nd century BCE. On it is a depiction of two men climbing a rock face by grasping and standing on pegs protruding from the rock. The railing of the Bharhut stupa illustrates numerous Jataka stories but I have long pondered over which one this scene is ment to be. The caption below the railing says it shows honey gatherers, which is quite plausible. Indian villagers and forest-dwellers do gather wild honey still in a way not unlike the scene on the railing (See Eric Valli’s Honey Gathers in Nepal). The problem is that there is no Jataka story which includes an episode of honey gathering. So I am inclined to think it is meant to illustrate the mountain climbing episode from the Chaddanta Jataka. There are problems with this identification. The Jataka tells of one mountaineer but here there are two, and his pack was made of leather while here the packs look more like cane. Nonetheless, if the two men are not gathering honey what are they doing? Any comments, including from mountain climbers or rock climbers would be welcome. What Is The Enlightened One Like? 1. What are enlightened people like? Well, some are men and some are women. You might find them in a monastery or a suburban home, in the forest or in a small country town. It is true that there are not many of them but there are a lot more than people usually think. It is not that enlightenment is inherently difficult; the sad truth is that most people cannot be bothered to pull themselves out of the bog of ignorance and craving. 2. At first you wouldn't notice the enlightened person in a crowd because he's rather quiet and retiring. But when things started to get heated, that's when he'd stand out. When everyone else was enflamed by rage he'd still be full of love. When others were in turmoil because of some crisis he'd be as calm as he was before. In a mad scramble to get as much as possible, he'd be the one over in the corner with the content expression on his face. He walks smoothly over the rough, he's steady amidst the shaking. It's not that he wants to make a point of being different, rather it's freedom from desire that has made him completely self-contained. But strangely, although others can't move him, his calm presence moves them. His gentle reasoned words unite those at odds and bring even closer together those already united. The afflicted, the frightened and the worried feel better after they have talked with him. Wild animals sense the kindness in the enlightened one's heart and are not afraid of him. Even the place where he dwells, be it village, forest, hill or vale, seems more beautiful simply because he is there. 3. He's not always expressing an opinion or defending a point of view, in fact he doesn't seem to have any views, therefore people often mistake him for a fool. When he doesn't get upset or retaliate to abuse or ridicule again people think there must be something wrong with him. But he doesn't mind what they think. He appears to be dumb but it's just that he prefers to remain silent. He acts as if he was blind but actually he sees everything that is going on. People think he is weak but really he is very strong. Despite all appearances he is as sharp as a razor's edge. 4. His face is always radiant and serene because he never worries about what happened yesterday or what might happen tomorrow. His carriage and movements are graceful and poised because he has a natural mindfulness of everything he does. His voice is lovely to hear and his words are urbane, clear and to the point. He is beautiful in a way that has nothing to do with physical appearance or eloquence but which comes from his own inner goodness. 5. He might have a house but if it burned down tomorrow he would move somewhere else and be just as comfortable there. He can be at home anywhere. Even those who try to cut down on the number or things they own always seem to have too much. No matter how much the enlightened one is given he always seems to have just enough. True, he seeks the necessities of life like everyone else but he takes only what he needs and his needs are very small. His life is uncluttered and simple and he is content with what comes his way. His real nourishment is joy, his real beverage is truth, his real home is awareness. 6. Ordinary people are as noisy as babbling brooks while the enlightened one is as silent as the ocean depths. He loves quiet and he speaks in praise of quiet. By this I don't mean he never opens his mouth. He's only too happy to talk about the Dhamma to those interested in listening, although he never preaches and he won't get involved in arguments or debates. Also, because he doesn't talk beyond what he actually knows everything he says is vested with an authenticity that the `experts' simply can't match. 7. The enlightened one's mind is not cluttered with thoughts nor is it inactive. When he needs thoughts he thinks and when he doesn't need them he lets them fall silent. For him they are a tool not a problem. He still has memories, emotions and ideas but he is unmoved by them. To him they are just magical illusions. He watches them as they arise, as they persist, as they pass away. His mind is like the clear empty sky - clouds drift through but it remains spacious, pristine and unchanged. 8. Although he is pure in all ways, the enlightened one doesn't think of himself as being better than, as good as or inferior to anyone else. Others are just as they are and there is no need for judgments or comparisons. He's not for or against anyone or anything. He no longer sees things in terms of good and evil, pure and impure, success and failure. He has understood the world of duality and gone beyond it. He has even gone beyond the idea of samsara and nirvana. Being beyond everything he is free from everything. No desires, no fears, no concepts, no worries. 9. Not so long ago the enlightened one was as confused and as unhappy as everyone else. So how did he get the way he is? It was simple really. He stopped looking for the cause of all his pain outside himself and began to look within. As he looked he saw that the things he identified with and clung to; body, feelings, emotions, concepts, problems; all were not his. And then he just let go. No longer entangled in the unreal he saw the real, the Unborn, the Unbecome, the Unmade, the Unconditioned. Now he abides in that empty, signless freedom and he's happy all the time. Because of this it is rather difficult to categorise the enlightened one. Others try to pigeon-hole him by calling him a saint, an arahat or even sometimes a fool. But he laughs at these labels and refers to himself as `a nobody'. How can you label someone who has transcended all boundaries? 10. Because he has completed his task and has nothing more to do the enlightened one spends most of his time sitting quietly minding his own business. To the ordinary person there may seem to be a dull sameness about the enlightened one's life. "Give me a bit of excitement, a bit of variety", they say. But of course when they get excitement or variety of the type they don't like - sickness, failure, rejection or death - then they fall into despair. That's when the enlightened one quietly steps forward to help and to heal. And because he's got plenty of time he can give himself fully to others. He touches everyone with his love. 11. He is happy to bide his time like this until the end and when death finally comes he embraces it without fear and goes his way without regret. What happens to the enlightened one after death? Scholars have argued about that for centuries. But you can't find where the enlightened one has gone anymore than you can trace the path of a bird flying free in the sky. In death as in life, the Trackless One leaves no tracks. 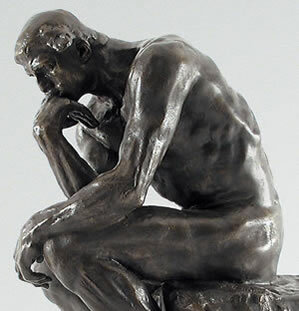 A thought (cinta) is a discreet mental event sometimes also called ideation or cognition. Thoughts can take the form of mental pictures or as sub-vocal speech. A string or flow of thoughts is called thinking (cetana). Some of the different types of thinking include problem solving, reasoning, reflecting, remembering, assessing, introspecting, decision making, imagining, etc. The Buddha classified thought processes as either logical thinking (vitakka) or wandering thinking (vicara). The first of these would be the deliberately sustained thinking that takes place during problem solving or reasoning, while day dreaming would be an example of the second. Thoughts and emotions are intimately connected, one often bringing forth the other. The Buddha gives as an example of this a man who thinks about some wrong he had done and then starts to feel guilty or depressed (M.II,165). He also recognized that deliberately thinking a certain type of thought often enough may result in the formation of a fixation and subsequent biases and prejudices. ‘Whatever one thinks about and ponders on (anuvitakka anuvicara) often the mind gets a leaning in that way’ (M.I,115). The mind (i.e. its thoughts) ‘precedes everything’ (Dhp.1), is ‘difficult to detect’, ‘very subtle’ ‘seizes whatever it wants’ (Dhp.36) and ‘thrashes about like a fish pulled out of the water’ (Dhp.34). The Buddha’s main interest in thinking concerned its power to distort reality, to trick us into seeing things that are not there and failing to see things that are, and to be ‘carried away’ by thoughts. In his famous Madhupindika Sutta he analyzed the process of cognition, starting with sensory contact (i.e. seeing, hearing, tasting, etc), ‘with sensory contact as cause feeling arises, what one feels one perceives, what one perceives one thinks about, what one thinks about one mentally proliferates. This mental proliferation (papanca), tinged with perceptions and concepts, obsesses a person in respect to the past, present and future’ (M.I,111-2). Thus the Buddha said; ‘The world is led around by mind, by mind the world is plagued’ (S.I,39) One of the preliminary goals of meditation is to slow down or if possible to stop the thought process so that the mind becomes more spacious and more quiet and rested. In the Vitakkasanthana Sutta the Buddha recommended five techniques for achieving this (M.I,119.ff). Mindfulness of breathing can also help with this. The Buddha said; ‘This concentration on in-and-out breathing, if cultivated and developed, is something peaceful and excellent, something perfect in itself and a pleasant way of living also. More than that, it dispels evil thoughts that have arisen and makes them vanish in a moment. It is just as when, in the last month of the hot season, the dust and dirt fly up and suddenly a great shower of rain lays it and makes it settle in a moment’ (S.V,321). In insight meditation one trains oneself to observe thoughts without reacting to them, or as the Buddha put it ‘in the cognized let there be just the cognized’ (vinnate vinnatamatttam, Ud.8). If this can be done the power of thoughts to enchant and mislead is minimised.